I know about the group name's origin, doesn't change its stupidity. Yes... Basingstoke, UK (where the Breaker is from) includes over 30 roundabouts on their roads, hence the place is also known as Doughnut City. The name is logical if you look at the city that The Breaker lived in. A very well designed intro, by a group with an incredibly stupid name. A bit overkill in the use of this intro, but hey... it is still a great one! 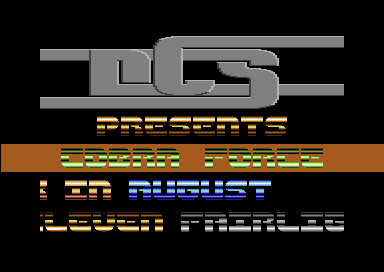 I really like this one because of the multi-coloured text raster-text scrollers :-) It would of been better if the DCS logo included bars in the border as well. A fine job... music also fits well.